Upgrade your Shimano rear derailleur with CeramicSpeed Pulley Wheels for reduced friction and extended lifetime. The pulley wheels are the fastest spinning bearings on your bike, making an upgrade to CeramicSpeed an effective way to save energy. CeramicSpeed Pulley Wheels can be used for all cycling disciplines, and will last longer than any standard pulley wheels. 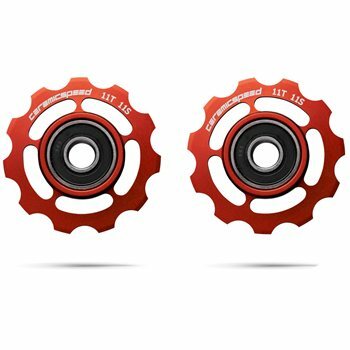 The CeramicSpeed Pulley Wheels for Shimano rear derailleurs are specially designed to reduce friction to an absolute minimum, virtually eliminating the drag associated with standard pulley wheels. Aluminium Pulley Wheels - These pulley wheels are made from a light Aluminium alloy that guarantees top performance, whatever your riding discipline. Ceramic bearings in both pulleys lower resistance and improve life span. Supplied with special oil which should be applied to the bearings seals when lubing the chain, after wet rides and after cleaning the bike.